The Savvy is Proton’s first introduction into the city car market. The Savvy is marketed more toward younger buyers and will be the company’s attempt to attract a different kind of buyer. The competition is stiff in this sector and budget brands have to be able to compete with more stylish brands. Proton’s five-door Savvy is a traditional city car. Complete with compact dimensions, yet unique with a distinctive style. The Savvy features a centre exit exhaust and a chunky front end. The bright colours being offered will appeal to younger buyers and give the car a sense of fun. The five-door hatchback provides easy access to the rear seats and a practical boot. The Savvy offers front-wheel drive good handling and a decent ride. The car has been designed to maximize interior space while still maintaining its compact size. The car’s engine is loud. It has a lot of pep and is very efficient, but drivers will have to become accustomed to the constant engine noise that will probably increase as the car ages. The car’s gear shift is also not as smooth as you would expect. Most buyers will be interested in the Savvy because of its low asking price, but the car can be fun to drive and offers decent steering that is responsive and has a good feel. The car’s suspension does a decent job as well and contributes to the pleasantness of the ride. In addition to a low asking price, the Savvy offers buyers low insurance rates and low maintenance costs. With good fuel economy, the Savvy will be an inexpensive car to buy and run. The Savvy offers front passengers respectable head and legroom. If you move to the rear however, headroom will be compromised. Moving further to the rear the boot is deep and spacious, offering a surprising amount of room for such a small car. The fascia is uncluttered and organized, but the buttons lack a quality feel. The instrumentation is hard to read, but is all logically placed. The Savvy provides passengers a smooth ride, with engine noise being the only intrusion. The seats are supportive and comfortable. Front passengers will enjoy much of the Savvy’s headroom, but rear passengers won’t be uncomfortable as they have plenty of legroom. The wide door apertures make it possible for occupants to enter and exit the car with ease. The car sits at a comfortable height, making it uncompromising when it comes to reaching the seat bottom. When accessing the boot, a low loading lip makes lifting large, heavy items into and out easy. This is accompanied by a wide boot lid aperture so access is unrestricted. The Savvy is very simple to park. Light steering and great visibility make reverse parking a cinch. The small dimensions make it possible to park the Savvy in the smallest of parking spots. The Savvy was not designed with driver pleasure in mind. Even so, the car does offer decent steering that responds well and has good feel. The suspension also strikes a good balance between ride and handling. The bad news is that the engine is loud and works hard to make decent progress. The Savvy would actually make a decent family vehicle. It provides good cabin space for four. Two children would easily fit in the rear seats. The boot is also large enough to accommodate a stroller and other good sized items. The Savvy would make an excellent first car. 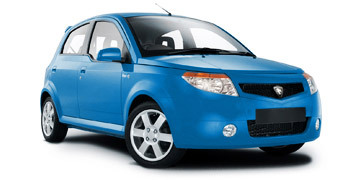 It has a stylish and appealing exterior design, and it enjoys low running costs. The car’s low purchase price will be very appealing to many first time buyers. The Savvy’s exterior design makes the Savvy look like a quality car. The attractive exterior does not really match the cheap interior. The car’s fit and finish are easily matched and beat by some well-known competitors for an equal or lesser price. Proton is largely seen as a producer of bargain vehicles, but is also known for reliability. The car comes standard with an alarm, engine immobiliser and central locking. The internal releases for the fuel filler flap and boot add an additional element of security to the Savvy. Proton has included an impressive level of standard safety. The car is equipped witht win airbags, seat belt pre-tensioners and ABS. Rear parking sensors are also a useful safety feature. The Savvy is fitted with a Clarion CD and radio unit. The unit has really good sound quality. The unit comes with four speakers and tends to falter a little at higher volumes. The majority of the dashboard is grey, and there splashes of colour on the instruments and fabrics. The overall feel of the cabin is dark. The fabric is decent, but the cabin’s plastics have a cheap feel. The Savvy is a fairly decent car. It’s a really good city car but the budget materials in the cabin are disappointing and the engine noise gets to be unpleasant.